See a new Artist View each month - now featuring Blakeley Hunter! Your donations help the National Art Education Foundation. Founded in 1947, the National Art Education Association is the leading professional membership organization exclusively for visual arts educators. The National Art Education Foundation (NAEF) invests in innovative initiatives to support instructional practice, research, and leadership in visual arts education. Learn more about applying for a grant or donating to NAEF. We want to share the world of art with more people, and one of the best ways to do that is to learn from the artists. Here you'll find interviews, demonstrations, tips, techniques, advice and insights from artists across a broad range. The purpose is to entertain as we educate and inform about art, artists and the process they take to create. This series will also be a fundraiser for the National Art Education Foundation (NAEF), which invests in innovative initiatives to support instructional practice, research, and leadership in visual arts education. Please consider donating and thank you for your support! In this Artist Interview, Blakeley shares a new process she's been experimenting with using crayons, but not in the way you might think. 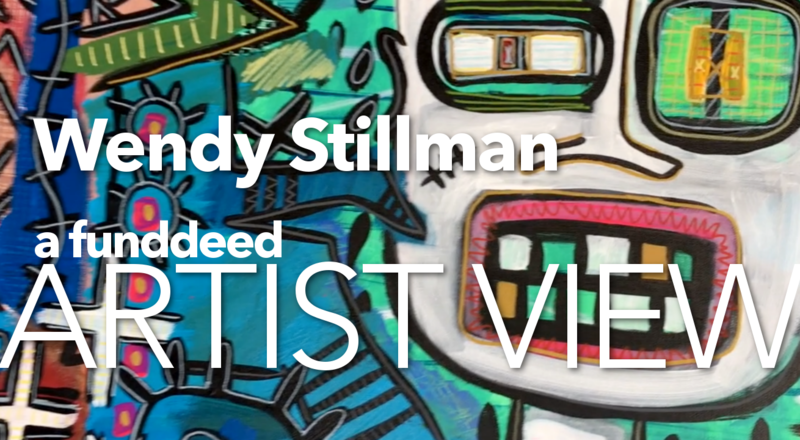 Wendy Stillman is an artist living in Manhattan Beach, CA. She is featured in our Artist View series to help support the National Arts Education Foundation. Wendy Stillman was born in Miami, FL and has lived in the UK, Canada, France and Austria before settling in Manhattan Beach, CA, where she also runs her jewelry business, Wendy Stillman Jewelry. "I started drawing and painting when I was a kid, and I never stopped because I couldn't stop. It's like getting dressed; it's always a part of my day." I'm a member of The Hermosa Beach Artist Collective, a workspace gallery in Hermosa Beach. I have also been privileged to teach art at the elementary level for the past 9 years through an amazing art program called Young at Art. Her paintings establish a link between the landscape’s reality and that imagined by its conceiver. These works focus on concrete questions that determine our existence. By examining the ambiguity and origination via retakes and variations, she investigates the dynamics of landscape, including the manipulation of its effects and the limits of spectacle based on our assumptions of what landscape means to us. Rather than presenting a factual reality, an illusion is fabricated to conjure the realms of our imagination. Watch Drica's full interview (edited) and hear more about here background, her influences and inspiration, along with her techniques and insights on how she works. Donate $50 or more and we'll plug you on our social channels as well as thank you personally in future updates! Donate $100 or more and in addition to social plugs and thank in our updates, you'll see your name in one of our future Artist View videos! Contribution Level	 Donate any amountSocial shouts!Video thank you! To donate any amount simply enter amount in the pop-up window.